Large undulating leaves edged with sharp spines and covered with bold silvery veins. Most attractive when young but very large and coarse as it ages. 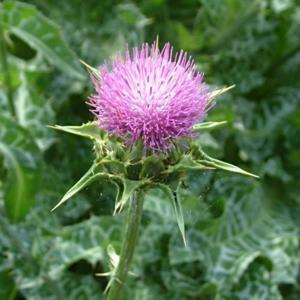 Biennial, producing thistle like purple-pink flowerheads in the second year. Well drained, neutral or alkaline soil, in full sun. 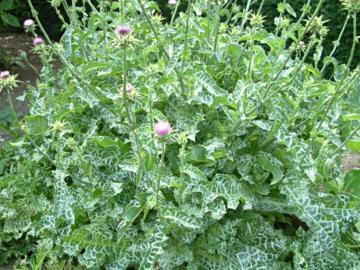 Traditionally used as a medicinal herb, especially in the treatment of liver problem. Used as a detoxifying agent. The active substance is known as Silymarin. Some parts of the plant are also edible and the seeds can be used as a substitute for coffee.